Palm reading is so last millennium & toe reading is now trendy! Forget about the eyes being the window to the soul; the soles are the window to the soul. You've heard of palm reading, of course. 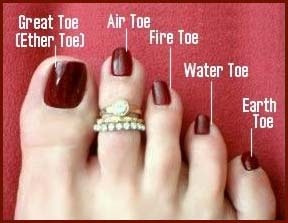 Now get ready for toe reading, a new and more aromatic way to metaphysically look into our inner selves, our flaws, emotions and relationships. KC Miller, director and founder of the Southwest Institute of Healing Arts in Tempe, Ariz., has been reading toes for six years and has trained about 200 others in the offshoot of reflexology. "Reflexology is the study and belief that everything that has ever happened in our life has left a holographic pattern in our feet," said Miller, who says things like "my mission is to teach people to touch lives, heal bodies and free souls" and "think of the toenails as windows." A toe reader examines the shape and condition of the five toes - which are called, from big toe to baby: the ether or destiny toe; the air or communication toe; the fire or "just do it" toe; the water or relationship toe; and the Earth toe. A twisted, broken or bent fourth toe, for example, could indicate a history of failed relationships (or a dropped bowling ball). It hasn't taken long for the practice to gain a toehold, so to speak. Miller is a sought-after guest at bridal showers and does seminars around the country. "People will literally stand in line for hours to get a toe reading," she said. And once they hear what she has to say, some break down in tears. Often the readings lead to "changes in consciousness" and end up being life-altering events, she added. You can do some of it at home. Calluses on your toes? "Almost always, that will connote that there is something happening in the neck," said Miller. Fungus on your nails? "Something is eating at them, inside and out. ... There is a metaphysical connection to it." Strange material between the toes? "That's probably hygiene." All kidding aside, Miller takes toe reading seriously. "I never hire anybody without having them show me their toes," she said, "because if their (fire) toe goes down, I know they are going to procrastinate and never get anything done." You don't need to go to Arizona to get your tootsies read; Miller can do it from a photo. Details are at her Web site, www.ToeReadingOnline.com. We sent Miller a photo of Plain Dealer style editor Kim Crow's feet (the picture is from a story she wrote in 2006 about pedicures) and had Miller do a reading. We then asked Kim's husband, Ted Crow, a Plain Dealer illustrator, to see how Miller did. 1. "The toe is a little off path. It would seem to me that somewhere along the line, she may have not beways taken the beaten path and that wasn't always of her choosing." 2. "I know that she's a dreamer. That she must have vivid dreams or perhaps she has a great intuition because of that little freckle. ... She hasn't had a lot of deep resentment. Had there been resentment, that would have turned into a bunion." Husband Ted's comment: "She definitely has no resentment. She doesn't have any intuition, either, but she is a dreamer." 3. "When she speaks her truth, she'll speak it honestly, but she's pretty good about being subtle. ... She will speak the truth, but she will hold back a bit." Husband Ted's comment: "I would say that's true. She'd make a good politician." 4. "She definitely gets things done. Occasionally she can almost be a little, tiny bit directive." Husband Ted's comment: "More than occasionally." 5. "It's almost turned back a little bit toward the ether toe. It makes me feel like she takes care of people, that she's a little bit of a caretaker." Husband Ted's comment: "Yeah, I guess you could say that. If dogs count, that's definitely true. 6. "That's her money toe. She has a great money toe. ... She's got one of the best money toes I've seen. Very shrewd and good with budgets and money." Husband Ted's comment: "Not true at all. Unless you count her scheming to come up with money to pay for her shopping." Ted's overall assessment: "More than 50 percent accurate. ... I'm a dead man." KC Miller has written a book, Toe Reading - Are Your Walking Your Destined Path? It may be ordered and sent to you.